A touch-optimized Microsoft Office app for Apple's iPad is less a matter of "if" and more a matter of "when," according to Microsoft CEO Steve Ballmer. 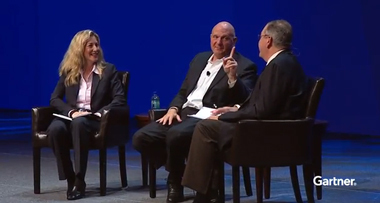 (L to R) Gartner analyst Tiffani Bova, Microsoft CEO Steve Ballmer and Gartner fellow David W. Cearley onstage at Tuesday's Gartner ITxpo 2013 keynote. Source: Gartner/YouTube.